Even in Neo4j with its high performance graph traversals, there are always queries that could and should be run faster – especially if your data is highly connected and if global pattern matches make even a single query account for many millions or billions of paths. For this article, we’re using the larger movie dataset, which is also listed on the example datasets page. I presume you use a sensible machine, with a SSD (or enough IOPS) and decent amount of RAM. For a highly concurrent load, there should be also enough CPU cores to handle it. Other questions to consider: Did you monitor io-waits, top, for CPU and memory usage? Any bottlenecks that turn up? If so, you should address those issues first. On Linux, configure your disk scheduler to noop or deadline and mount the database volume with noatime. See this blog post for more information. For best results, use the latest stable version of Neo4j (i.e., Neo4j Enterprise 2.2.5). There is always an Enterprise trial version available to give you a high-watermark baseline, so compare it to Neo4j Community on your machine as needed. Set dbms.pagecache.memory=4G in conf/neo4j.properties or the size of the store-files (nodes, relationships, properties, string-properties) combined. Set heap from 8 to 16G, depending on the RAM size of the machine. Also configure the young generation in conf/neo4j-wrapper.conf. That’s mostly it, config-wise. If you are concurrency heavy, you could also set the webserver threads in conf/neo4j-server.properties. The result of this query is shown below in the visual query plan tool available in the Neo4j browser. While the visual query plan is nice in the Neo4j browser, the one in Neo4j-shell is easier to compare and it also has more raw numbers. Check – with either schema or :schema – that there is an index in place for non-unique values and a constraint for unique values, and make sure – with EXPLAIN – that the index is used in your query. Even for range queries (pre-Neo4j 2.3), it might be better to turn them into an IN query to leverage an index. 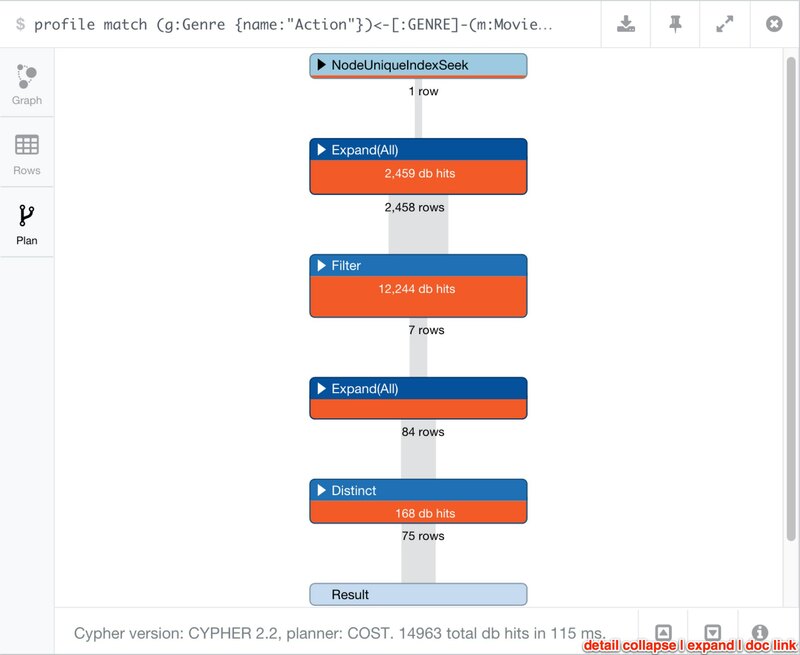 If you have a pattern (node)-[:REL]→(node) where both nodes on either side are already bound, Cypher will optimize the match by taking the node-degree (number of relationships) into account when checking for the connection, starting on the smaller side and also caching internally. So, for example, (actor)-[:ACTS_IN]->(movie) – if both actor and movie are known – turns into that described Expand(Into) operation. If one side is not known, then it is a normal Expand(All) operation. Make sure that if nodes on both sides of a longer path can be found in an index, and are only a few hits of a larger total count, to add USING INDEX for both sides. In many cases, that makes a big difference. It doesn't help if the path explodes in the middle and a simple left-to-right traversal with property checks would touch fewer paths. If we add the second index-hint, we get 10x fewer database hits. Make sure to access properties only as the last operation – if possible – and on the smallest set of nodes and relationships. Massive property loading is more expensive than following relationships. This query shown above accesses p.name for all people, totaling 400,000 database hits. Instead, you should aggregate on the node first, then order and paginate, and only in the very end should you access and return the property. This second query above only accesses p.name for the top ten actors, and before that, it groups them directly by the nodes, saving us about 200,000 database hits. There is an optimal implementation for single path-expressions, by directly reading the degree of a node. Personally, I always prefer this method over optional matches, exists or general where conditions: size((s)-[:REL]->()) ← uses get-degree which is a constant time operation (similarly without rel-type or direction). This query shaves off another 50,000 database hits. Not bad. Note to self: Optimized Cypher looks more like Lisp. When following longer paths, you’ll encounter duplicates. If you’re not interested in all the possible paths – but just distinct information from stages of the path – make sure that you eagerly eliminate duplicates, so that later matches don’t have to be executed many multiple times. This reduction of the cardinality can be done using either WITH DISTINCT or WITH aggregation (which automatically de-duplicates). This query has 10,272 db-hits and touches 3,020 total paths. This query tuning technique reduces the number of paths to match for the last step to 2,906. In other use cases with more duplicates, the impact is much bigger. We still need the distinct m2 at the end, as the co-actors can have played in the same movies, and we don’t want duplicate results. This query has 7,791 db-hits and touches 2,906 paths in total. If you are also interested in the frequency (e.g., for scoring), you can compute them along with an aggregation instead of distinctly. In the end, You just multiply the path count per co-actor with the number of occurrences per movie. The best way to start with query tuning is to take the slowest queries, PROFILE them and optimize them using these tips. If you need help, you can always reach out to us on Stack Overflow, our Google Group or our public Slack channel. If you are part of a project that is adopting Neo4j or putting it into production, make sure to get some expert help to ensure you’re successful. Note: If you do ask for help, please provide enough information for others to be able to help you. Explain your graph model, share your queries, their profile output and – best of all – a dataset to run them on. Need more tips on how to effectively use Neo4j? Register for our online training class, Neo4j in Production, and learn how to master the world’s leading graph database. Michael Hunger has been passionate about software development for a very long time. For the last few years he has been working on the open source Neo4j graph database filling many roles. 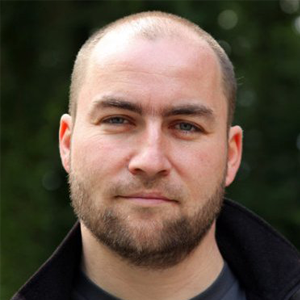 As caretaker of the Neo4j community and ecosystem he especially loves to work with graph-related projects, users and contributors. As a developer, Michael enjoys many aspects of programming languages, learning new things every day, participating in exciting and ambitious open source projects and contributing and writing software related books and articles. Great article! This kind of information is super helpful to devs like me who are writing and tuning Cypher every day. There were a bunch of suggestions I didn’t know about. Thanks! and I have different results. plan of query with size doesn’t count the nested db-hits and it is slower.